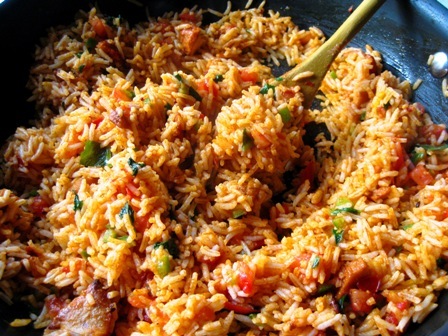 A few days ago, after my morning meditations, I felt unexplained craving for tomato rice. I had prepared a large batch of basmati rice the night before, so all I had to do was heat some olive oil in my favourite large frying pan, sprinkle in some asafetida and I’d be half-way there. I chopped a large green Jalapeno from the last of my chilies, plus half a large, very hot yellow Habanero, and sauteed them in the hot, hing-flavoured oil. I then tossed in the basmati rice, and a handful of freshly-picked chopped garden herbs – mint leaves, parsley and rocket. Then I diced and folded through a large extra-ripe tomato. I remembered I had a small amount of BBQ mock-duck in the fridge, so that went in. Finally, I sprinkled in a large tablespoon of top quality Spanish smoked paprika, and my extemporaneous cooking adventure was done. I grabbed my camera, and then…it tasted as delicious as it looks! It wasn’t until afterwards that I realised that I had been thinking of tomato rice the day before, after watching my old TV clip of a South Indian Tomato Rice dish. Thoughts get lodged in the mind by exposure to the media, and they are sure to surface again, in the form of desires and cravings. Advertising works!